Today is a big day. To the devoted, it is bigger than birthdays. Bigger than Independence Day. Bigger than Thanksgiving, Christmas, and Easter all rolled together. Super Bowl seems to bring out the ardent fan in even the most casual football observer. People who don't follow the sport the rest of the year can often be found huddled together, eating chips and salsa while they yell at the big screen. For all of you out there who say you watch it only for the commercials, it's time to fess up. You still get sucked in, don't you? If you're anything like me, you've picked a team by halftime and you hold your breath for them till the end. But the Super Bowl is more than just amazing athletes, odd commercials, and hit-or-miss halftime shows. The idea of cheering for your team is key. It's that rush you get when you attach your allegiance to one group and support them to the end. If they win, you feel like a tiny piece of the victory belongs to you, too. Sorry to pull out an old cliche, but the big game of life is similar to the Super Bowl. Not only do we all get to choose a side, we have to. It's required, and vital to our survival. When it comes right down to it, there are only two sides. Not to say that the sides are evenly matched. God is by far stronger, and superior, in every way. He's the big winner, regardless of anyone's opinion. But we still need to choose. You see, when you don't choose, you make a choice by default. If we choose God's side (and really, why wouldn't you?) then we'll want to raise his banner. We'll want to proudly proclaim him. Just like those Wisconsin fans who so proudly wear their cheese-shaped hats. 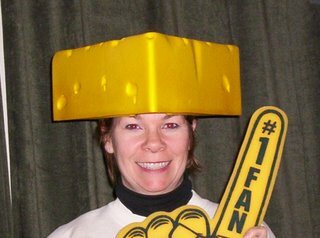 I'm not sure what the spiritual equivalent is to a cheesehead, but if I did, I'd be wearing it today! Won't you join me? A happy day to all. And may you back the winning team! I used to take it as an excuse to eat chips even though I don't watch it! Jen, I love how you've taken Super Sunday as an example of 'team loyalty'. I was at a hockey game last night and thinking through some of these same things, Jen! Here in Columbus, football is focused on the Ohio State Buckeyes. 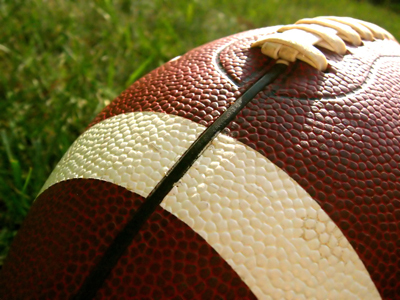 The Super Bowl is fun, but it's not as huge as it is some places. Tonight I probably won't even watch the commercials. I've got writing to do! Deb, there's chip and spinach-artichoke dip at my house, and only two of us here eat it! But I'll dip a chip in your honor. Lisa, good for you! Write like the wind. That's my goal for today, too. Jen, have you ever seen the PBS cartoon Word Girl? From the planet Lexicon she comes to Earth to fight crime and bad vocabulary. Probably not, since Billy is older, but anyway, today we both need our super hero masks and capes. Word Girls! My family is from Pittsburgh, so tonight is huuuggggeeee!!!!! Can't wait to watch Dad dance around the house with his terrible towel. Daughter and father wore Steeler attire to church this morning. No doubt my neice will be in her Steeler cheerleading outfit, and I do believe my nephew has a Steeler blankey and pacifier. In my Bible class, someone suggested saying each morning before you start your day, "I choose you, God." That way, you've reinforced, outloud as well as in your heart and soul, exactly whose team you're on. By the way, even though my sports team rarely wins, I know God's team will always win. As I listened to a certain family member (who shall remain nameless) in intercessory prayer last night during just about every play (yes, sadly, you heard me right) it served as a great reminder that God's team is the only team worth our true loyalty.